Whether you spend most of your time traveling or you live in your RV permanently, you likely consider your RV home. And it should be treated that way! Having an RV that reflects your taste and personality will make your RV experience much more rewarding. Updating your RV can start with the interior. While it may seem like a lot of work, there are simple projects that can be done to update your RV and make it more you! This may seem too simple, but it makes a world of difference. If you’re still using age-old furniture that’s better suited for your grandma’s house, ditch it! Buying new pieces of furniture, be it couches or chairs, will take your RV to that next level of comfort. Windows in an RV are your way of seeing the world on the road, and letting that natural light flood in. So you can treat them like windows in a home, rather than car windows. Add curtains; redesign the shape of them; and make them as bright as ever. That’ll give your RV a more sophisticated, organized look. All too often, we maintain the mindset that an RV is for camping, and should look like that, with a basic kitchen that’s only there for utility. But why settle for that? 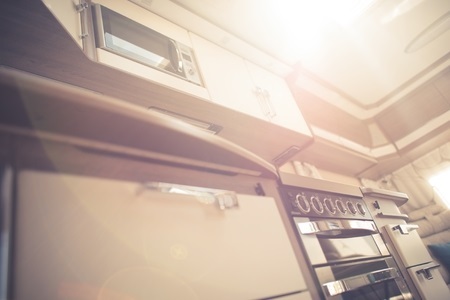 If your RV is your home, then give it a kitchen that it deserves. New appliances, a new coat of paint, and who knows — maybe even a few new cabinets to store more food for the road. We’ll leave the design specs up to you! After you’ve done these simple projects, we guarantee that the RV of your dreams isn’t far off. It’ll look like your next home in no time. Hemet Valley RV Siding & Storage is a dual-functioning company in California, specializing in aluminum and fiberglass RV Siding and Aluminum RV Travel Trailer Siding.